In honor of Childhood Cancer Awareness Month, Friends of St. Jude (FOSJ) Miami, the young professionals group dedicated to raising awareness and funding for St. Jude Children’s Research Hospital® invites the South Florida community to its 9th Annual International Dermatology “It’s All About the Kids” on Saturday, October, 1 at 7:30 p.m. 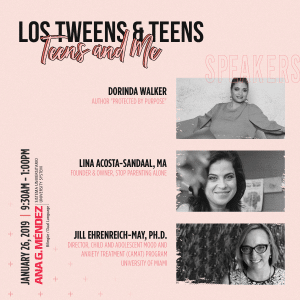 The signature event, presented by the Andrés Asion Foundation, will take place at the JW Marriott Marquis in Downtown Miami. 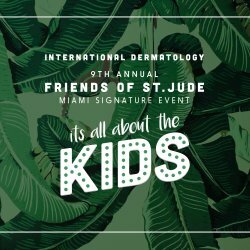 As part its commitment to raise awareness and funding for St. Jude Children’s Research Hospital, FOSJ- Miami is honored to celebrate its 9th Annual “It’s All About the Kids” signature event. FOSJ Miami has raised more than $1 million to help ensure no family ever receives a bill from St. Jude for their treatment, travel, housing or food. Hosted by Univision’s Pamela Silva-Conde, co-host of Primer Impacto and WPLG Local 10’s, Victor Oquendo, the evening will include a live auction conducted by Enrique Santos, Chairman and Chief Creative Officer or iHeartLatino, with all proceeds benefitting the children and families at St. Jude. St. Jude will be presenting the “St. Jude Stephan Gutierrez Award” to Enrique Santos for his philanthropic and humanitarian efforts. Guests will also enjoy a tasting menu and cocktails, as well as entertainment by DJ Pete Diaz accompanied by a Bongo Player. Tickets can be purchased online at stjude.org/itsallaboutthekids or by calling (305) 265-1371. To join the event conversation online, use the official hashtag: #FriendOfStJudeMiami. St. Jude Research Hospital has the world’s best survival rates for some of the most aggressive childhood cancers, and treatments invented at St. Jude have helped push the overall childhood cancer survival rate from 20 percent to 80 percent since we opened more than 50 years ago. Families never receive a bill from St. Jude for treatment, travel, housing or food – because all a family should worry about is helping their child live. Join the St. Jude mission by visiting stjude.org (http://www.stjude.org/), liking St. Jude on Facebook (facebook.com/stjude (http://www.facebook.com/stjude)) and following us on Twitter (@stjude (http://www.twitter.com/stjude). 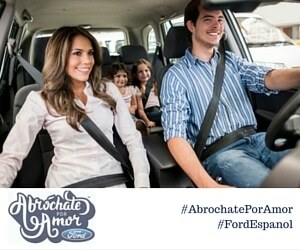 This entry was posted in For Mothers & Tias, Videos and tagged Cancer Research, Miami, st jude hospital. Bookmark the permalink.